In the last years of the 19th century, the strip of Fifth Avenue from 13th Street to 23rd Street was lined with so many religious institutions – churches, publishing houses, and missions – that the area became familiarly known as Paternoster Row. When Mary Stuart, widow of millionaire Robert L. Stuart, died in 1891 leaving a $1 million bequest, the Presbyterian Church laid plans for an office building to house its missionary work. With unintentional appropriateness, the location chosen was the northwest corner of Fifth avenue and 20th Street, where Mary and Robert Stuart's brownstone mansion still stood. Designed by architect James B. Baker the 12-story structure cost $1.76 million to build--nearly $51 million in today's dollars. Baker drew inspiration from French Gothic chateaux, giving the Presbyterian Building spiky dormers capped with finials, a red tile roof and an imposing entranceway of successively smaller arches leading to an ornate lobby. Slowly other tenants moved in. The Daughters of the Revolution rented “a large room” as their business headquarters in January 14, 1896 around the same time the "King’s Daughters” took space for their devotional exercises. By May of 1897 the building was 90 percent rented with rental income of $82,438; although the outstanding mortgage of $900,000 still made many General Assembly members nervous. The possible sale of the building was repeatedly discussed but never acted upon. One new lease holder, The Woman’s National Sabbath Alliance met here on March 3, 1897 to unanimously adopt a resolution that condemned the United States Senate for holding a Sunday session on February 28. The next year, a few days before Christmas in 1898, the Woman’s Board of Home Missions of the Presbyterian Church held a heated meeting when Brigham H. Roberts of Utah was elected State Representative. With the 20th Century Paternoster Row became more diversified. Dr. A. C. Alberston had his offices at No. 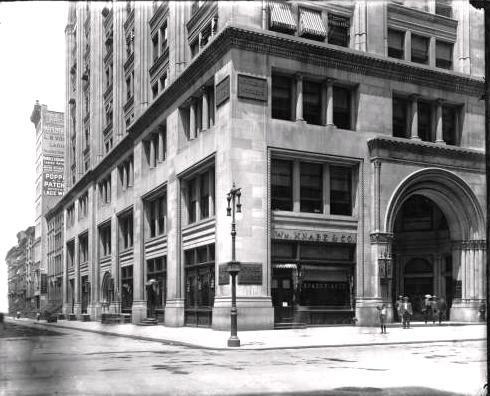 156 in 1900, piano manufacturer William Knabe and Company occupied the corner store space in 1903 and in 1906 the building was home to construction firm Charles T. Wills, Inc. which built such structures as the Judson Memorial Church, the New York Life Insurance Company building and the Carnegie mansion. Today No. 156 Fifth Avenue remains an striking presence on lower Fifth Avenue, amazingly little unaltered. 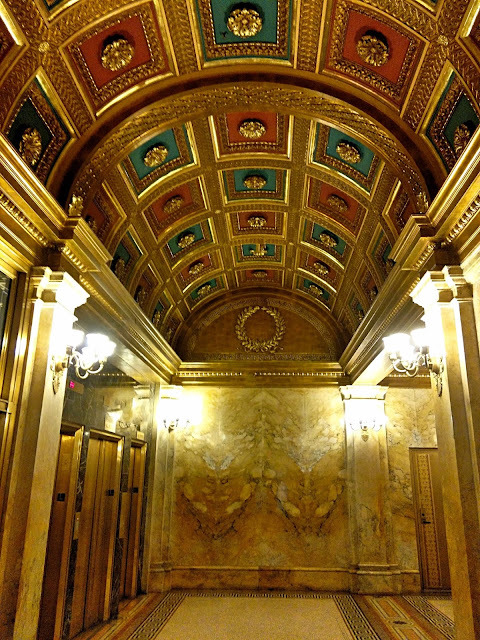 I know this building well and have always been taken by its beautiful entrance on 5th Ave. I had no idea its full history - thanks! absolutely correct. Thanks for the catch. I corrected it. I have a small basket with the label still attached, reading: "From National Missions Gift Shop, Room 722, 156 Fifth Avenue, New York City". Price was 75 cents. I am guessing it was purchased in 1930s? This was not mentioned in the article, and is perhaps not known to the author, but the architect of this building is James B. Baker. In 1902 landscape architect Harold A. Caparn moved his office into 156 Fifth Avenue. He was in 1911 elected President of the American Society of Landscape Architects and taught briefly at Columbia University. In 1912 he was named landscape architect of the Brooklyn Botanic Garden which position he retained until his retirement in 1945. Thanks for the info on the building. Worked as an office boy in the building during the early 1960's for the ADA (Americans for Democratic Action) and a notable feature of the building was that it was powered by DC not AC. 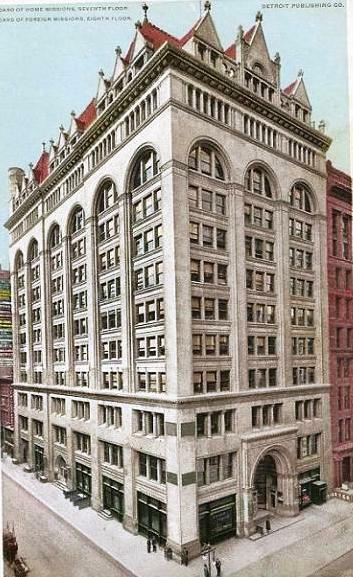 This building was a relic of the Edison vs Westinghouse battle over wick mode of electrical power was superior. The National Missions Gift Shop was located there. I have an ethnic cloth doll with a yellow tag that reads, National Mission Gift Shop, 156 Fifth Avenue, New York City. During the very early Sixies, the New York John Birch Society had its headquarters here, in the office of some other right-wing group. I believe the Mission was selling items from the American Indians in their gift shop. The labels verify this. Today many of these are valuable such as jars and dolls. You may have a treasure if you find some. I have a small Bible with an FDR introduction dated Jan 25, 1941 that was distributed by the Pocket Testament League - National Headquarters for USA - 156 Fifth Avenue, New York City, N.Y. This location was also the site of the New York offices of Sir Wilfred T. Grenfell's non-denominational medical and evangelical mission to Newfoundland and Labrador. Industrial handicrafts (wooden toys and carvings and hooked silk stocking mats) were produced by local Newfoundland and Labrador residents, and were sold to raise money to support the mission's many activities. In doing some genealogy tonight, I came across a WW1 draft registration card from September of 1918 for my 2nd great-uncle Edwin Andrew Scott. He listed his occupation as a publisher and owner of a sheet metal concern at this building. Thank you for keeping the history of this beautiful structure alive.